Retirement is not a phase of life that we should feel apprehensive towards. Given proper planning and a positive attitude, senior years can be both fulfilling and empowering. 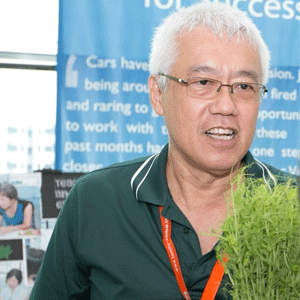 John Quah, 65, retired 3 years ago as a maintenance officer and decided to take the opportunity to learn something new. He signed up for the Intergenerational Learning Programme (ILP) to embark on his learning journey. He first started attending ILP 2 years ago and has since attended more than 10 different programmes including “My First Green Harvest” which was held at ITE college West. He said “the students at ITE West are passionate and knowledgeable, they taught us hydroponics which is very new to me and they encouraged me to start planting some herbs at home. I like this method of planting as it is cleaner and easier to maintain.” John does not only learn hydroponics from students, he also shares his life experiences with them while they interact. This mutually beneficial relationship between the students and himself has allowed him to have a much better understanding of young people today in terms of their language, life values and how they communicate. John feels that he can bond with his grandchildren more easily as a result of the programme. **Special thanks to John Quah who accepts the interview. We wish him all the best in his lifelong learning journey. For a full list of short courses, click here.